The Chinese Calendar states that 2013 is the Year of the Snake. Fashion and jewelry designers have taken this opportunity to offer many incredible designs this year which feature snakes and other reptilian forms. Snakes have been popular in jewelry in the past. Victorian jewelry popularized the snake motif in the late 1800s. The 18k yellow gold “Scorpion” necklace above, ca. 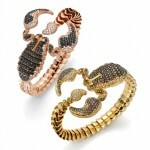 1978, was created by Italian designer Elsa Peretti for Tiffany & Co. The necklace, which is formed of interlocking segments, has a detachable tail, so that just the scorpion claws can be worn as a collar. An example came up for sale at auction this past fall at Freeman’s in Philadelphia. I wanted this necklace and bid over $4,000. The necklace ultimately sold for over $11,000. I’ll just have to keep looking for another one for myself but who knows when another example will surface? 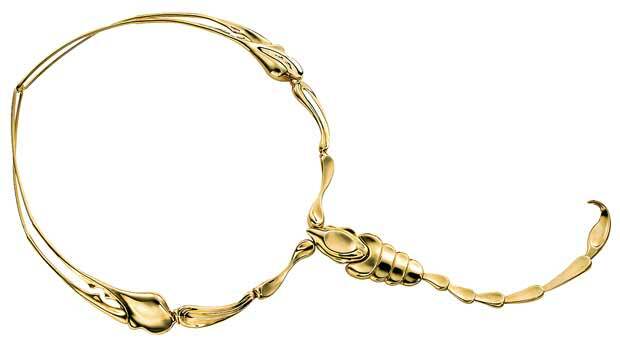 A Bulgari Sertenti Gold snake bracelet. $54,000. 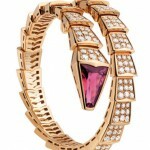 This is a J. Hadley pave diamond, swirl snake ring with ruby eyes that is set in 14k yellow gold and rhodium. Price is $3,800. 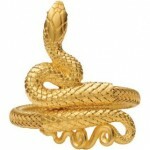 The Metropolitan Museum of Art Museum Store is offering this Eyyptian Revival goldtone snake bracelet. Price is $150.